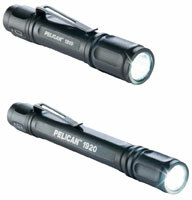 It’s been a while since Pelican has released any new lights, so we were intrigued to see the announcement of Pelican’s new 1910 and 1920 LED flashlights. Running on one AAA battery, the 1910 has an output of 39 lumens and weighs just 1.4 oz with batteries. The 1920, a 2AAA version of the 1910, productes 67 lumens and weighs 2.2 oz. Runtime for the 1910 and 1920 is 1h and and 2h 45m, respectively. These new lights are made of Type II anodized aluminum with a matte non-slip finish, and both use a tail cap switch with momentary capability. MSRP is $32.95 for the 1910, and $35.95 for the 1920. We’re looking to have a review of these new lights within about a month, so stay tuned!